I arrived at Bari airport on a beautiful sunny day in February to be greeted by the driver from the Borgobianco Resort and Spa in Puglia, Southern Italy. 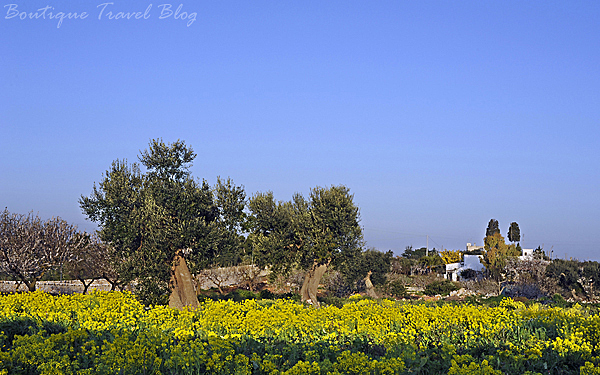 Soon we were on our way and once outside Bari’s conurbation we were passing fields of ancient, twisted and gnarled olive trees, interspersed with blossoming almond trees rising from a carpet of vivid orange and yellow wild flowers. Every now and again, partly hidden by the trees, we’d spot a tumbled-down trulli, the traditional cone-shaped buildings unique to Puglia; a beautiful part of Italy, yet to be discovered by mass tourism. Pretty country lanes lead to the hotel which is a few miles inland from the lovely seaside town of Polignano a Mare. 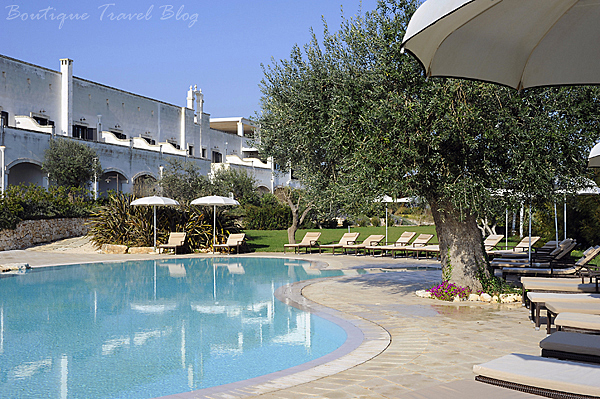 The fields of wild flowers and olive groves make an enchanting setting for the grand, white-stone hotel that nestles comfortably within its surroundings. 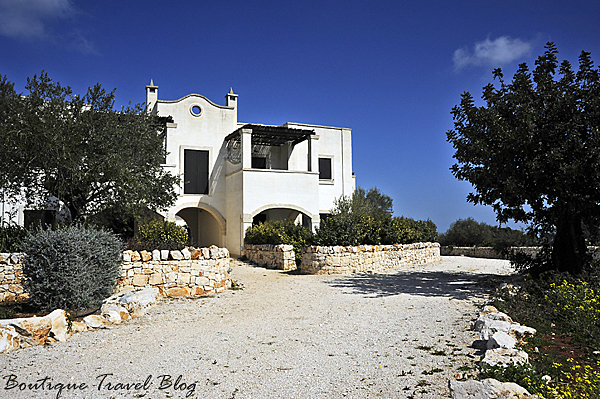 You would never guess that it was built just 4 years ago as it was designed with the local architectural traditions and building materials in mind, in the style of the local masseria, the rather grand farm houses of the area. On arrival we receive a warm greeting from Laure who arranged the press trip. Originally from France, she came to Polignano for a two week holiday. She felt so at home here she decided to stay! Passing a spacious courtyard with a shaded seating area and a tinkling fountain, I am shown to my delightful room with doors leading out to my own terrace overlooking the gardens. 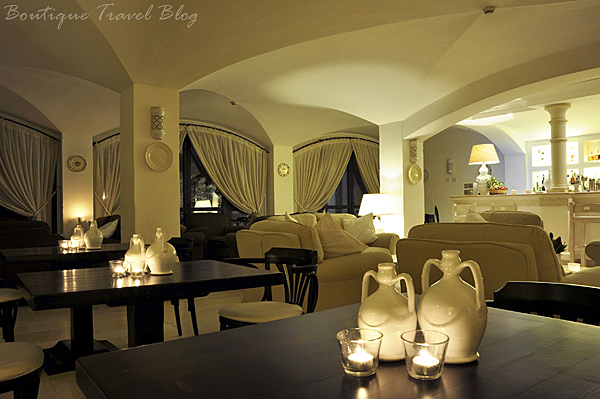 It is decorated all in white, as is the entire hotel, creating a cool and relaxing atmosphere throughout. With indoor and outdoor swimming pools (with heated hydro massage pool), spa with sauna, steam room and gym, 48 rooms and suites, 2 meeting rooms and free Wi-Fi this beautiful hotel really has a lot to offer. After un-packing I have a couple of hours to relax. 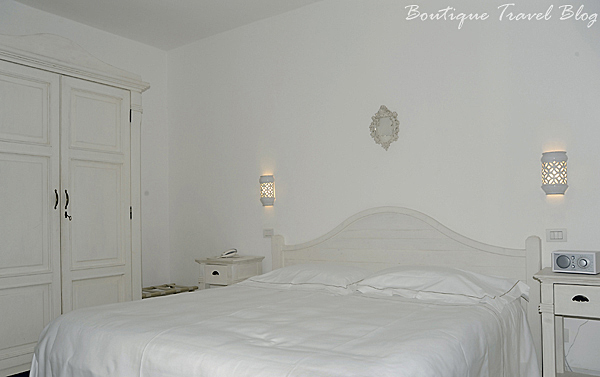 My room is perfect with a spacious wardrobe, desk, comfy chair, flat screened TV and mini-bar. In the en-suite bathroom, everything I could possibly need is provided including a pretty matching set of body wash, moisturiser, shampoo and conditioner. The heated towel rail keeps the fluffy white towels and robe continually warm and dry. There is even a pair of slippers in the wardrobe. We are offered an aperitif before dinner. Cosimo, our bartender and an expert at creating the most delicious cocktails with a unique flair and charm, readily suggests one of his favourites for me to try. My Aperol sour really hits the spot. Upstairs in the restaurant the hotel’s head chef, Leonardo, has selected a special 6 course dinner to show off the best of all that the hotel and the region has to offer. Red mullet, scampi risotto and ‘slowly cooked’ shi drum (a fish, previously unknown to me) are on the menu, followed by two desserts! Cosimo, who is our waiter for the evening, recommends a Tormaresca Chardonnay, to compliment our meal. I can see that the next few days are going to be a serious set back for my diet. Never mind. Needs must! My stay at Borgobianco is just for a few days but I have a massage in the hotel’s spa booked and a tour of Polignano to look forward to. Plus we’ll be visiting the beautiful Alberobello, with its famous trulli lined streets, the little harbour at San Vito, the medieval town of Ostuni (known as The White City), and the stunning cave system at Castellana Grote. And the weather, although a little chilly in the evenings, is a sunny 20 degrees plus during the day – perfect for exploring Puglia. What more could I ask for? It was!. Superb hotel and really lovely staff and owner.